Ingredients: Water, Plantfibers, Humectant (E 422/E 1520), Salt, Nicotine, Flavors, Salmiac, pH Adjuster (E 500). 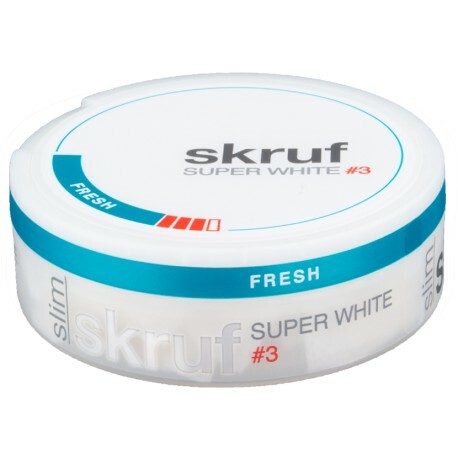 Skruf Super White Slim Fresh No.3 ( Strong) is an all-white portion snus. Skruf All-white portions contain no tobacco but do have nicotine. The properties means this snus does not discolor the teeth or contribute to the classic snus smell while giving you a strong nicotine experience. Rest easy: all snus in the All White category does contain all-important nicotine; from regular strength to extra strong! after a roll of this stuff, regular Snus tastes like a bag of salt. Also my mouth feels much cleaner than with the regular Snus. Excellent product. This is easily one of the mintiest snus I've ever used, just smelling it lets you know how minty it is. It's not something I'd personally use daily, but it's really refreshing to use every now and then. I highly recommend it for mint fans.